A frantic search for a missing six-year-old boy in Seneca, Mo. 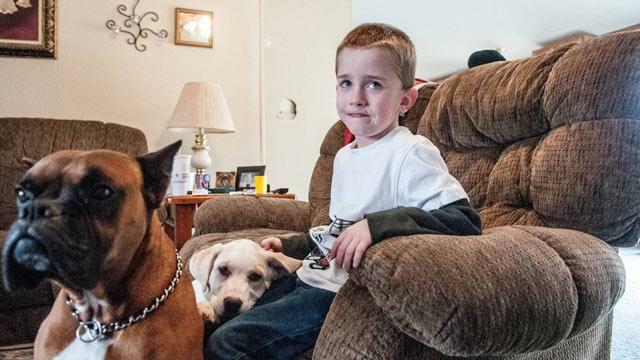 ended in relief when deputies discovered the boy huddled under a bush with his two dogs for warmth. As temperatures plunged into the low 20s, Ryle Smith was discovered about a mile from the family house with Baxter, a large Boxer, and Bella, a Labrador mix lying on top of the boy keeping him warm. "He was wearing no socks or shoes," Ryle's mother Holly told ABC News. "His feet were so cold that it was the early stages of frostbite, he hadn't eaten dinner, he was exhausted and hungry." Ms. Smith said that according to paramedics, the dogs were lying on top of the boy; they could tell because his upper extremities were warm. Ryle disappeared at about 4:30 Tuesday afternoon, following his puppy Bella away from the family property while playing outside. His parents called 911. Between 150 and 200 people responded to the alert to assist with the search. "Complete strangers drove from surrounding cities and showed up at our doorstop," said Holly Smith. "It was incredible. Most people have told me they have never seen a response like that." "We were real concerned about the weather," Newtown County Sheriff Ken Copeland told ABC News. "It was calling for sleet and snow later that night so we were really concerned." Copeland said responders from the Newtown County Sheriff's Office as well as the Joplin, Seneca and Redings Mill fire departments, and the Newtown County Rescue and Recovery team, joined in the search, in addition to concerned local citizens. "Here in Joplin we went through the terrible tornado," said Copeland. "To see all these agencies and the community come together… it went really well."